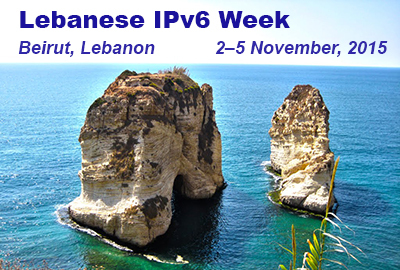 The RIPE NCC, in coordination with Data Consult, presents IPv6 Week in Beirut. IPv6 Week comprises a three-day workshop, held from 2-4 November, followed by an IPv6 Coordination Day, held on 5 November 2015. IPv6 Week aims to support the technical expertise of the Lebanese Internet community with regards to IPv6 deployment and transition mechanisms. The week concludes with an IPv6 Coordination Day, which includes case study presentations of successful IPV6 deployment. This event offers decision-makers and network engineers the opportunity to share knowledge, compare experiences and identify areas for national cooperation. IPv6 Week is open for anyone to attend and is free for all participants.